When John Mulaney’s first hour-long stand-up special New in Town debuted on Comedy Central, I remember sitting up and taking notice. There was nothing particularly provoking about Mulaney’s jokes in the way that great comedians before him used humor to provide deeper insight into the human condition, but his storytelling had such a genuine and captivating air about it that I couldn’t stop watching. His jokes naturally flowed one to the other in the way only a true writer could structure; I hung on his every word, waiting to hear what he shared next. Three years have passed since that moment, and, like many a person aware of Mulaney’s work—including his not so successful attempt at a sitcom earlier this year—I eagerly anticipated hearing more of his stories when his second full-length special debuted on Netflix on November 13. Like the non-taboo comic he is, Mulaney discusses topics both frivolous and lighthearted. When he does go weightier—like discussing legalizing marijuana or religion—he never delves into dangerous territory. He might call attention to the trenchant issues embroiled in each one (white people’s free pass and altar boys), but only briefly. His focus lies elsewhere: on these topics’ lighter side. It’s a perspective that has made some like Marc Maron question the voice Mulaney has to offer. Where is the darker side? What else does he have to share with the public that he’s not? Great comedians, the assumption prevails, are those willing to go there. My anticipation and its payout were immediately and irrevocably rendered meaningless when, upon finishing watching, I learned about the attacks in Paris and watched stunned as the death toll rose and the unspeakable horror of such attacks became increasingly clear. Comedy in that moment seemed a frivolous gesture in the wake of such a tragedy; writing about comedy seemed even more so. And yet laughter is an important tool in this moment. There’s a reason people tuned into David Letterman, Jon Stewart and even Saturday Night Live after 9/11. It’s not to ignore such events through laughter; it’s because laughter, in its own way, helps make sense of a world that at times seems as if it’s running off the rails. In Mark Twain’s short story, ominously titled “The Chronicles of Young Satan,” he astutely wrote, “For your race, in its poverty, has unquestionably one really effective weapon—laughter. […] You are always fussing and fighting with other weapons. Do you ever use that one? No, you leave it lying rusting.” This perspective comes from Satan’s nephew of all people, who interacts with the narrator in at first charming and eventually monstrous ways. It’s one of my particularly favorite quotes, and the thing I thought of as I faced the task of writing about The Comeback Kid all while the 24-hour news channels were awash with fresh savagery. For the comics who venture into political waters or charged topics, these individuals provide an important service by calling “BS” where it needs to be called. They offer up a weightier humor because of the important service such humor renders. Mulaney doesn’t do that, but he offers as important a perspective. Beginning his stand-up by talking about the hubris of making a birthday sign without first stenciling the letters, the joke felt as light as a joke possibly can. It’s not flighty or shallow. As Eric Idle wrote on Twitter, “They can kill humans but they will never kill humanity. Vive le France.” There’s humanity in laughter. And the kind of laughter Mulaney encourages seems imperative in the wake of the hatred that led to November 13 in Paris. Rather than find the comic and follow him to the stage, as so many other specials begin, The Comeback Kid opens on panoramas of Chicago, the shots slowly wending their way through the city until it reaches the Chicago Theatre, where it tracks through the doors, behind the stage and up the stairs to Mulaney’s dressing room. As innocent an opening as the first two minutes seem, they state the obvious: Mulaney is not your typical comic. This is not your average special. For one, it’s not going to explore the humorous angle of darker topics; instead, it’s going to remain on firmly lighter but still irreverent footing. In The Comeback Kid the room he played to was far bigger than the one he faced in New in Town, which caused Mulaney to pace the stage in an unusually energetic way for the normally droll comic who comfortably plants himself front and center to spin his yarns. That frenetic feeling aside, Mulaney looked older and more mature, discussing his recent marriage and life as a husband to the great American hero that is the real estate agent. Mulaney’s two comedic strong suits are his ability to dissect popular culture to hilarious effect (and this time Back to the Future’s Marty McFly and Doc Brown, as well as HGTV, end up on his skewer) and the yarns he spins from his own childhood and adolescent experiences. When he does go after pop culture in his new special it’s with a slightly more rushed energy than befits his jokes. 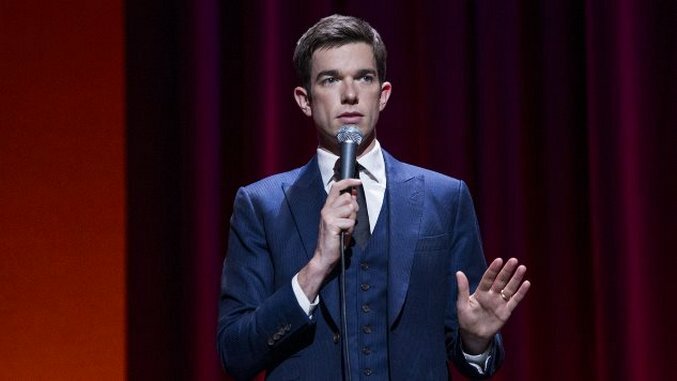 Mulaney’s work benefits from the writer’s carefully crafted timing, and in the past he’s adeptly drawn out parts, punctuated others and built his jokes with a cadence and rhythm that add to their humor. At times throughout The Comeback Kid, that felt lost in his eagerness and enthusiasm to play such a large venue, and his attempts to augment his act to play to the rafters. As for his lengthier tales, which include Mulaney trying to be an alpha male of the house so his French Bulldog Petunia stops ruling the roost, and the time he met Bill Clinton when the Arkansas governor was running for president, he finds his footing more assuredly, reminding audiences why he does what he does so well. As much as it would be nice to analyze Mulaney’s work in a vacuum, divorced from the events that transpired on the day of its release, that seems an impossible task. What I’m forced to conclude is that laughter—of the light-hearted kind alongside its more serious counterpart—remains not only important but also necessary. Mulaney’s mostly clean, high-spirited comedy revels in that necessity. It’s one reason why he’s so clearly glad to be back performing stand-up, helping create laughter in a world that benefits so greatly from it.